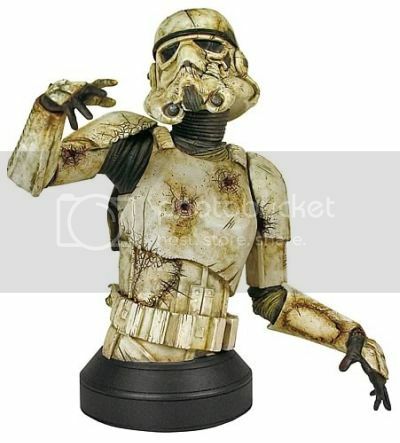 Behold the Zombie Stormtrooper Bust. A.k.a., the “Death Trooper Bust,” based on the Star Wars: Death Troopers novel. Because for every delightful geeky concept (Star Wars + zombies + space violence… squeee! ), there’s at least a handful of nerds willing to fork over $75 each to commemorate the week that they were TOTALLY into that concept before moving onto something else like HEY!, LOOK, SOMETHING SHINY! Stop making stupid things like this. Now please. Just because zombies = cool and Star Wars = Cool DOES NOT mean that zombies + star wars = cool.